Based upon grocery receipts using Nielsen scanner data (Kilts-Nielsen Data Center at the University of Chicago Booth School of Business), nearly 1/3 of all Arrowhead brand water is sold outside state boundaries of its aquifers. 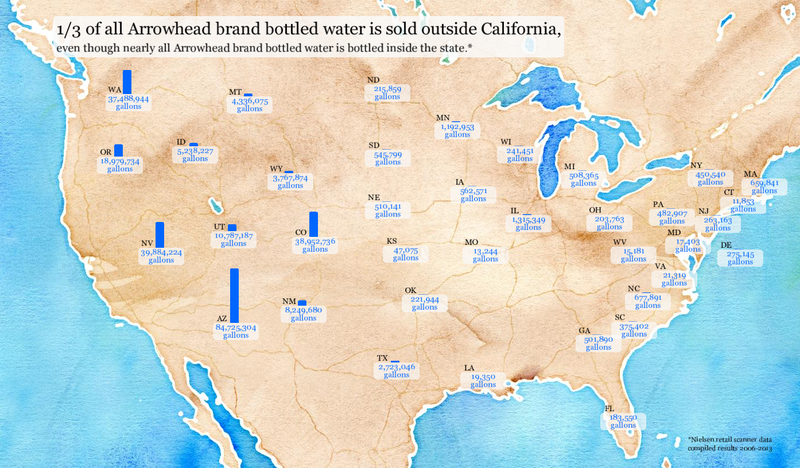 We developed a visualization of bottled water sales for the bottled water Arrowhead brand (Nestle). Nestle’s Arrowhead brand of bottled water has 11 of its 12 aquifers located in California (the 12th is in Colorado), and 2006-2013 sales of the bottled water expand out across the country (shown below). Listed Locations of Nestle’s aquifers (http://www.nestle-watersna.com/asset-library/Documents/AR_ENG.pdf, which was last accessed April, 2015). Hope Springs, Hope BC Canada and/or Ruby Springs, Chaffee County, CO.